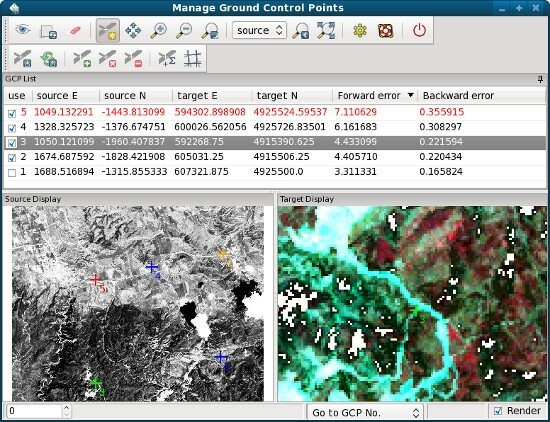 g.gui.gcp - Georectifies a map and allows managing Ground Control Points. The GCP Manager is a wxGUI extension which allows the user to create, edit, and manage Ground Control Points. It is available from the menu "File | Manage Ground Control Points". The GCP Manager provides an interactive graphical interface to manage and analyze Ground Control Points. A backup copy of the initial POINTS file is always maintained and updated only on request (Save GCPs to POINTS file). This guarantees that accidental changes are not permanent and can be undone by reloading the Ground Control Points. The topmost panel shows a list of Ground Control Points. Tools to manipulate and analyze GCPs are provided in the toolbar. This panel can be moved out of the GCP manager window by either dragging with the caption or by clicking on the pin button on the right in the caption. This panel can also be placed below the map displays by dragging. The two panels in the lower part are used for map and GCP display, the left pane showing a map from the source location and the right pane showing a reference map from the target location. Numbered Ground Control Points are shown on both map displays. Two toolbars are provided with the GCP Manager, one for managing the map displays and one for managing the GCP list. The list of Ground Control Points can be sorted by clicking on a column header. Clicking on a cloumn header will sort the GCPs ascending, a second click on the same column will sort the GCPs descending. Overall RMS error and individual RMS errors of all points are often improved if the GCP with the highest RMS error is adjusted. Individual coordinates can be edited by double-clicking on a row. The first column holds a checkbox and displays the point number. A GCP is only used for RMS error calculation and georectification if its checkbox on the left is checked. Uncheck to deactivate a GCP (mark as unused GCP). The left panel is used to display a map from the source location, the right panel to display a map from the target loaction. Zooming in and out is always possible with the mouse wheel and done for each map canvas separately. GCPs are displayed in different colors, depending on whether a GCP has a high RMS error, is currently unused or is currently selected. Optionally, currently unused GCPs are not shown on the map display. At the bottom of the GCP Manager is a statusbar providing several functions. The default is set to Go to GCP No. (see also below). Typing a number or using the up/down arrows will center the maps on the given GCP, useful with a high zoom. Displays maps for source and target canvas and re-renders any layers that have changed since the last time the display was updated. Re-renders both source and target canvas regardless of whether they have changed or not. Interactive selection of a new center of view in the active display monitor. Drag the pan cursor while pressing the left mouse button to pan. Alternatively left-click on the new center. Panning changes the location of the region displayed but not the size of the area displayed or the resolution. Interactive zooming with the mouse in the active map canvas (source or target). Drawing a box or just a left click with the mouse and zoom-in cursor causes the display to zoom in so that the area defined by the box fills the display. The map resolution is not changed. Clicking with the zoom-in cursor causes the display to zoom in by 30%, centered on the point where the mouse is clicked. Zooming changes the display region extents (both size and location of area displayed). Interactive zooming with the mouse in the active map canvas (source or target). Drawing a box or just a left click with the mouse and zoom-out cursor causes the display to zoom out so that the area displayed shrinks to fill the area defined by the box. The map resolution is not changed. Clicking with the zoom-out cursor causes the display to zoom out by 30%, centered on the point where the mouse is clicked. Zooming changes the display region extents (both size and location of area displayed). The extents of the source display are adjusted to the current extents of the target display. Sets the currently active map canvas (source or target). Click to set active map canvas for Return to previous zoom or Zoom to extent of currently displayed map. Alternatively, move the mouse over the map canvas to be used as active canvas. Zoom to the extent of the currently displayed map in the active map canvas (source or target). Only the GCP with the highest RMS error will be displayed in a different colour, both in the list of GCPs and the GCP Map Display. All GCPs with an RMS error larger than mean RMS + RMS standard deviation * this factor will be displayed in a different colour, both in the list of GCPs and the GCP Map Display. As a rule of thumb, GCPs with an RMS error larger than M + SD * 2 are most probably wrong. GCPs with an RMS error larger than M + SD * 1 are worth closer inspection. This option is only available if Highlight highest RMS error only is unchecked. Set the polynomial order for georectification. This order will also be used for RMS error calculation. Clip raster maps to the current computational region in the target location when georectifying. The current list of GCPs is saved to the imagery group's POINTS file and to a backup copy. Recalculates forward and backward RMS error for all GCP marked for use (activated checkbox in first row). The GCP map display statusbar is similar to the statusbar in the regular GRASS GIS map display with two differences, Go to has been replaced with Go to GCP No. and Projection has been replaced with RMS error. If Go to GCP No. is selected, a GCP number can be given in the left side of the statusbar and the source and target map canvas will be centered on the given GCP. Clicking on the map canvas will update coordinates for this GCP. See also video tutorials on GRASS Wiki.